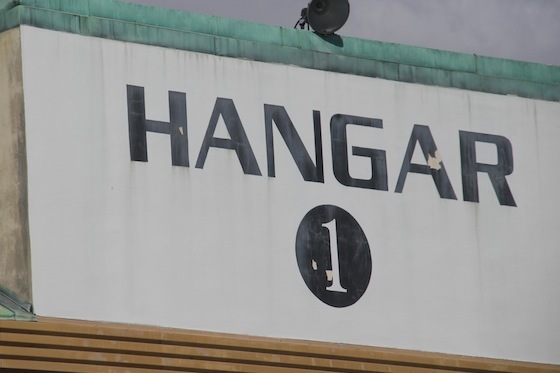 Today Nick’s parents are in town and they decided it would be fun to head over to Alameda for a tasting at the St. George Spirits distillery, where they make (among other wonderful things) Hangar 1 vodka. I’m always game for a tasting, so I was super excited to go! You can see where the magic happens through large windows in the tasting room. 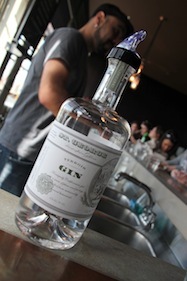 Tastings are currently $15, and you get to taste about 10 different spirits. 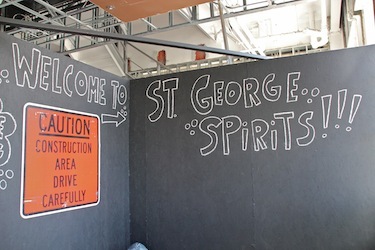 St. George stuff is high quality and not cheap, so the cost for the tasting really isn’t bad at all. First, we tried their pear brandy, which was lovely. It had a very nice, true pear flavor, and it wasn’t as sweet as we thought it would be. 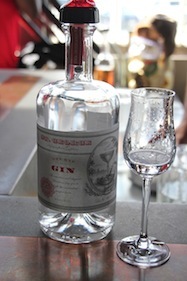 Next, we had their traditional “Botanivore” gin which was great, and then a special “Terroir” gin that had ingredients like Douglas Fir and California Bay Laurel and Coastal Sage, literally harvested from nearby Mt. Tamalpais; this was supposed to taste “like a hike” … and whew, it did. It was very green, which I picked up a bit more soapy flavor from than I’d have liked to – almost like an industrial cleaner – I think if it were in a mixed drink (our bartender said it’s great in a dirty martini) the flavors would be complimented better though. 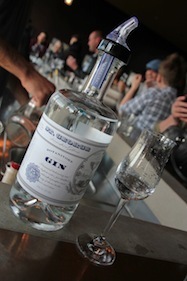 Then we had their “Dry Rye” gin, which we thought was great. It had notes of caraway and pepper which gave it a nice warmth and fantastic character. 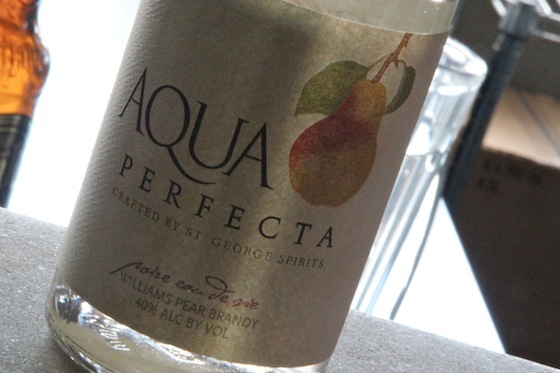 Then we had their “Spiced Pear” vodka, which was delicious as well. 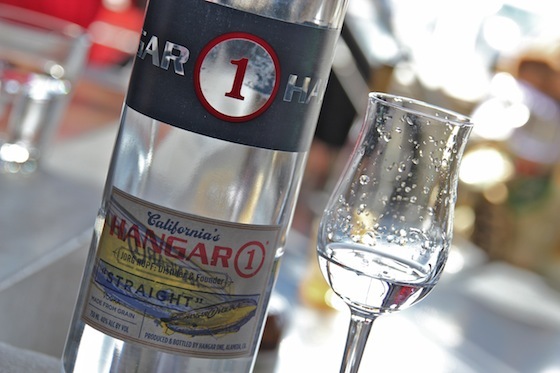 Hangar 1 does a lot of seasonal vodkas – Nick’s parents said their raspberry one is great – it wasn’t a part of the tasting (I think they save it for the summer), but it is available in stores. 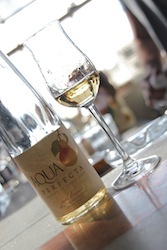 They’ve done an excellent job of keeping that true pear flavor in their offerings, and this was another nice example. We were actually pretty lucky to be able to taste this because they actually only make it once a year and in small batches. 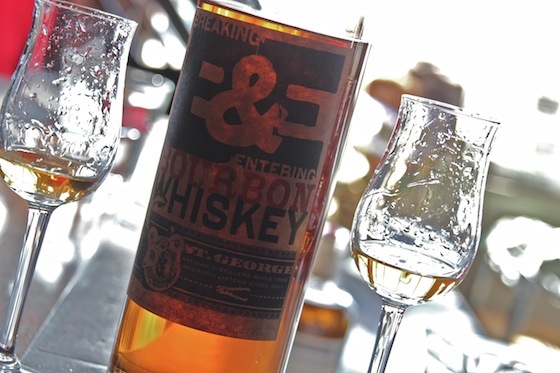 Next, we shifted gears a bit and tried their “Breaking & Entering” Bourbon Whiskey. 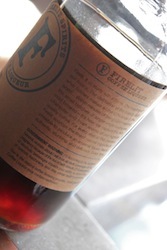 It’s named that because they didn’t actually distill the spirit in-house (or else it wouldn’t be bourbon anyway), but used a hundred or so “lifted” barrels of bourbon from a collaborating distillery in Kentucky, then made their own special “California” blend with them. I like bourbon, and this one was good. 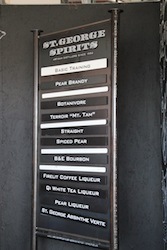 I appreciated how they were coordinating the tasting to showcase the different bodies and styles of spirits we were moving from and to. We went from that nice, fresh, green pear flavor, to the herbal gins, then had the wonderfully smooth, “Straight” palate-cleanser, and then into some warmer tones like this bourbon. 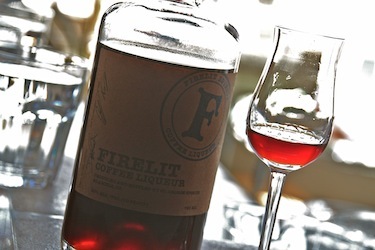 Next, we tried their “Firelit”coffee liqueur, made with brandy and the Bay Area’s own Blue Bottle coffee. It was fantastic. It had a nice kind of burnt character in it that enhanced the notes of the coffee. It wasn’t syrupy thick and sweet like most coffee liqueurs, and it had a really nice coffee flavor. 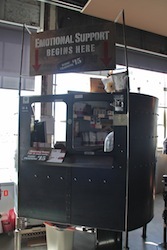 This was another one I’d like to have on my shelf. 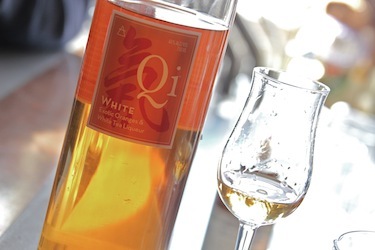 After the coffee liqueur, we had some sweeter stuff – their “Qi”, an interesting white tea and citrus liqueur, which had a nice floral note to it from the tea, and a delicate, fresh orange essence. 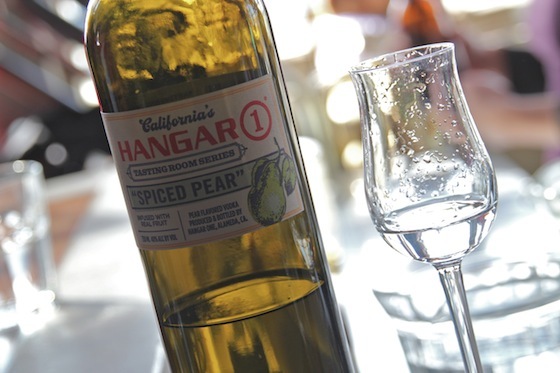 Then we had their Pear Liqueur – looks just like the brandy we started with, doesn’t it? But it’s not – it’s a liqueur! This was a bit darker and had a more concentrated flavor and sweetness than the brandy. I should have asked to taste them both side by side just to get the more subtle differences – that pear brandy seemed so long ago! 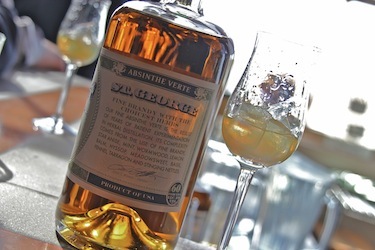 The last thing we tasted was their absinthe, which was also very nice. As they say on their website, “STEP AWAY FROM THE MATCHES AND PUT DOWN THAT SUGAR CUBE.” Absinthe used to be prepared by pouring water into the absinthe over a sugar cube on a slotted spoon, because original absinthes were remarkably bitter. Apparently in some bars and movies, pouring the absinthe over the sugar cube and then lighting the sugar cube on fire (absinthe has an over 50% alcohol content) for a show is sometimes done. 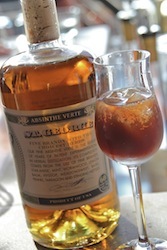 They do neither of these things here – just an ice cube is added, and as the ice melts, the “louche” forms – this happens when the essential oils in the absinthe separate and emulsify as water dilutes the spirit. A beautiful milky quality emerges, and that’s when you know the absinthe is ready to drink. After we had a few sips, the bartender added some organic root beer to our glasses so that we could enjoy the melding and mixture of the herbal qualities in the absinthe and the root beer together. This was a fantastic tasting, through and through. I only wish we had planned better and could have gotten here in time for the tour which, on Sundays, is only offered at 1pm. The tour is free, and they make sure to have space in the tasting room if you want to taste afterwards, so that’s really cool. 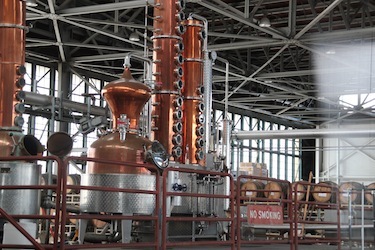 I’ll definitely be back for a tour soon to be able to see more of the distillery, and I’ll be looking forward to the other treats they’ll be showcasing in the tasting room!